You’ve no doubt heard President Trump and other politicians complain about our elections being “rigged.” Election fraud and illegal voting, of course, are quite rare and only occur on a very, very small scale. But political parties use legal gerrymandering to actually rig elections and hang onto their power, and it represents one of the greatest threats to our democracy. The word gerrymandering was coined in the early 1800s to refer to the manipulation of legislative or congressional district boundaries to give an unfair advantage to one political party over the other, initially in reaction to a redrawing of Massachusetts state senate election districts under Gov. Elbridge Gerry. When mapped, one of the redrawn districts in the Boston area was said to resemble the shape of a salamander and greatly benefited Gerry's own party. Gerrymandering works like this: every ten years with each census, district boundaries are redrawn by the party in power at the time. With today’s sophisticated mapping and demographic technology, one party can draw a district that packs their voters into one area or spreads their voters throughout the state to significantly dilute the voting power of the other party and achieve a desired electoral result. Either way, it’s designed to give the party in power the advantage in winning elections. 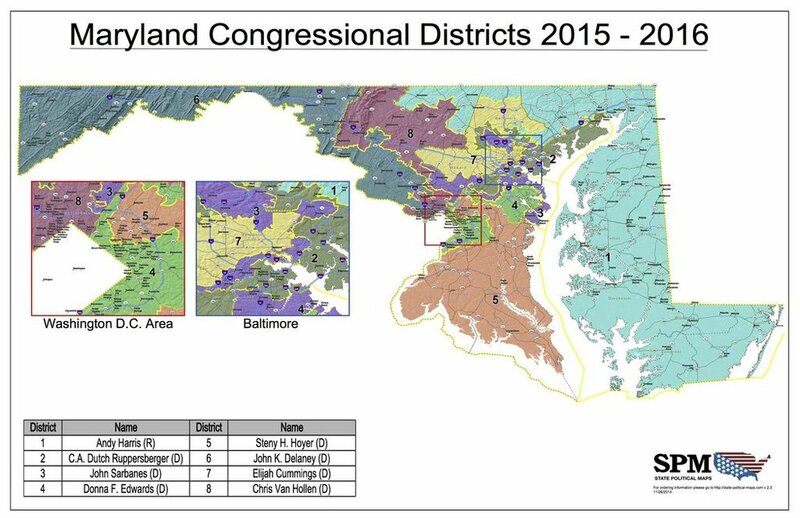 To see how gerrymandering works, just take a look at a map of the 3rd Congressional District in my home state of Maryland, which has become the poster child for how gerrymandering distorts congressional districts to a ridiculous degree. The district consists of three oddly shaped, disjointed pieces of geography that extend from Baltimore’s Inner Harbor like spreading tentacles. Gerrymandered districts like this are why over one-third of Maryland’s State Senators and more than 25 percent of Maryland’s Delegates have no general election challenger. Gerrymandering has numerous consequences for democracy. It practically enshrines incumbents, making it difficult if not impossible for challengers from another party to build coalitions of support. Incumbents end up running away from the middle because they are afraid of losing their primaries. As a result, we have the hyper-partisanship in Washington that prevents things from getting done. Gerrymandering also discourages political participation by citizens. If you’re squeezed into a district full of voters from the other party, you might think, ‘What’s the point of voting?” The races are then decided by geography and not much more. Fortunately, the courts have stepped in. Recent rulings in Pennsylvania and North Carolina found that each state’s maps for U.S. House violate the state constitution’s guarantees of free expression and equal protection. Just this week, the U.S. Supreme Court reviewed but declined to take up two gerrymandering cases in Maryland and Wisconsin – the Maryland case is a Republican challenge to a Democratic-drawn map; the Wisconsin case is a Democratic challenge to a Republican-drawn map. Although both states’ maps will be intact for the 2018 elections, justices have left the door open for future challenges to partisan gerrymanders. But, even with court decisions, can we really expect the two parties to go back to the drawing board and configure the maps evenly and fairly? Both parties have clearly shown that their primary goal in redistricting is to put their thumbs on the scale and rig the system in their favor. Voters need to demand that politicians of all stripes support the creation of an independent, non-partisan commission to redraw the nation’s congressional districts to ensure fair elections and better representation. It’s one of several political reforms that I favor as an unaffiliated candidate for the U.S. Senate, and it’s one reform that will only come about with new, independent leadership in Washington.